As dawn breaks, two queues start forming at the only petrol pump inLakshmangarh, a small town in Rajasthan's Alwar district. One, obviously, is of people waiting to get their vehicles' fuel tanks refilled. The other is in front of a simple metal box mounted on the petrol pump's boundary wall. People like to call it an ATM machine. But, instead of dispensing cash, it gives them clean drinking water. On her turn, 26-year-old Sapna Jatav takes out a plastic card and holds it in front of a sensor of the water ATM. The sensor reads her card and shows a balance of Rs 130. Jatav places a 10-litre container below a pipe on the water ATM and presses a button. Reverse osmosis (RO) processed water starts flowing from the pipe. Jatav releases the button when the container is full. The machine calculates the quantity of water dispensed and deducts the amount from her account. One litre costs 50 paisa. 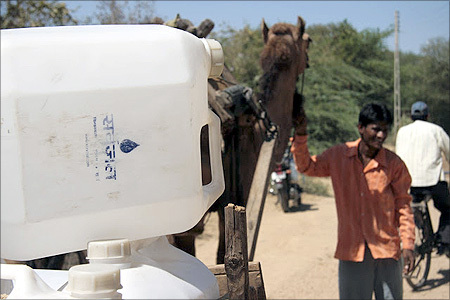 Photographs: Courtesy, Piramal Water Private Ltd. The technological initiative, powered by solar energy, is changing the lives of many in Rajasthan, Gujarat and Madhya Pradesh. Earlier, people depended on the saline municipal water or groundwater that has high fluoride content. "Water was not fit even for cooking," says homemaker Rekha Atolia. A study conducted last year by Jhunjhunu-based JJT University states that fluoride content in Alwar groundwater is much beyond WHO'S permissible limit. High fluoride in water is responsible for increasing cases of renal failure in the district, says the study published in Global Journal of Pharmaceutical Research in September 2012. 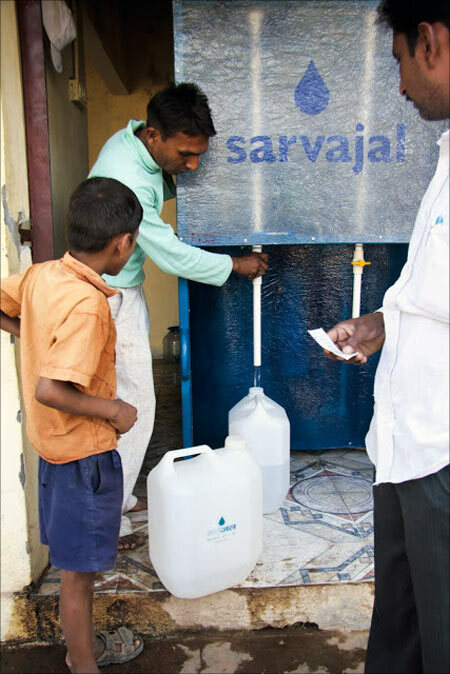 Dharamveer Singh, sales head of Sarvajal, the company started by Piramal Foundation, shares the journey of the water ATM. "In 2008, we were brainstorming possible technological solutions to the problem of contaminated water. 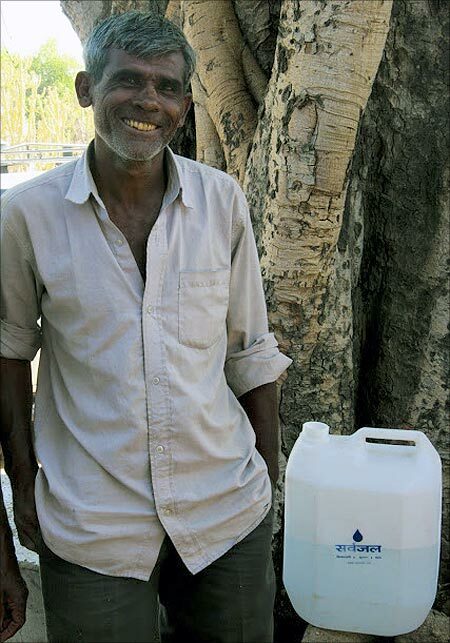 We also wanted to reduce the drudgery of women who travel long distances to fetch water," Singh reminisces. 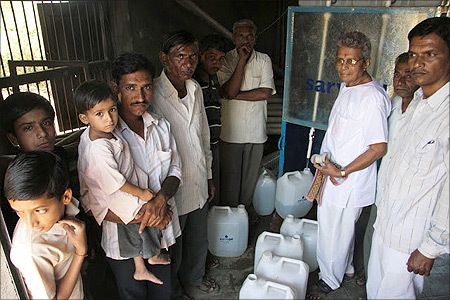 Sarvajal started with door-to-door supply of RO water. 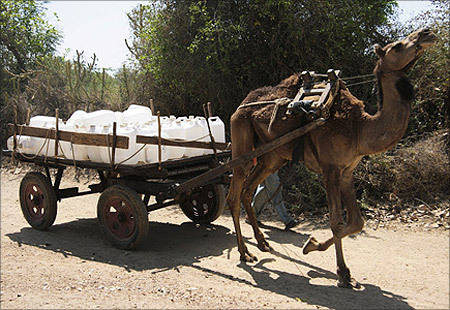 An RO plant was set up in Jhunjhunu's Bagar village. But problems started cropping up soon. "Different people would give different delivery times. With little staff this was difficult. Also, door-to-door delivery involved manual labour, which we wanted to reduce," says Singh. Another problem was of delayed payments. To solve these issues, Sarvajal thought of water ATM and pre-paid cards. The ATM has a water tank kept locked above the machine. The tank is connected to the RO plant, which uses groundwater for processing. The plant can process 1,000 litres in an hour. Processed water is carried to the tank using booster pumps. The machine has three buttons - of 1 litre, 5 litres and 10 litres. People could scan the card on the ATM's sensor and press the button, depending on their water requirement. The problem with the ATM was that many a time a lot of water would get wasted because there was no standard size of containers that people brought with them. So, if a customer pressed the five-litre button and the container's size was 4.5 litres, half litre would go waste. The advanced model of water ATM took care of this issue. The technology uses GSM, or Global System for Mobile communications. It helps Singh keep track of all the 20 machines installed while sitting at his office in Jaipur. A software called Soochak informs Singh on his mobile phone of damage in any machine. For example, if the percentage of Total Dissolved Solids (TDS), a kind of water impurity, crosses the permissible limit, the RO plant would automatically stop functioning and Soochak would alert the operator. Singh claims the system is so sophisticated that he is alerted even if a pipe starts to rust. Every machine is also checked properly once a month, he says. Sarvajal claims to recharge the wastewater produced during the RO process. "Groundwater here has high TDS content. Processing leaves 50 per cent water with TDS content," says Singh. This water is sent back to the aquifers through recharge wells. The operation of water ATMs is managed through local partners. "The idea is to promote local entrepreneurs," says Sharma. It is a profitable business for the company as well. The total cost of setting up the RO plant with the machine is around Rs 5 crore. Franchisees pay 40 per cent of their earnings to the company.